I was contracted by Plump to redesign the website for the podcast, Hidden Forces. We wanted to develop the website into a destination where fans of the show could access all of the podcast content, research topics of interest and explore laterally across topics. The creator and host, Demetri Kofinas, is a technology and media entrepreneur and the podcast features weekly interviews with the most brilliant minds in technology, finance, social science, and the hard sciences. Because the guests span a broad variety of domains many of our conversations were about developing a taxonomy for organizing the content. We wanted the site operate as a map, of sorts, to help users navigate the connections between concepts and relate to Demetri's experience as he researches new topics. Usability and portability were guiding principles in the design. We wanted to eliminate the need for a separate downloadable app for mobile use. 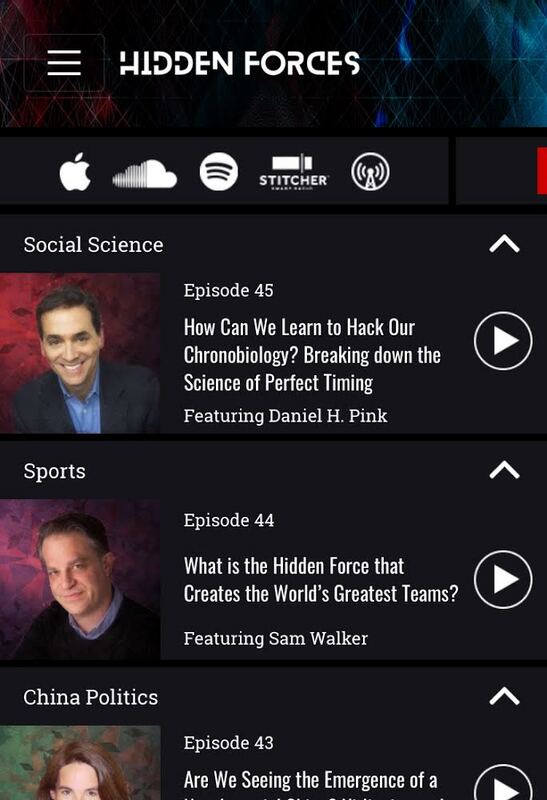 The user can listen on all the major podcast platforms but the real strength of the design is that, from the main podcast feed, the user can listen to episodes while navigating the site and accessing deeper levels of content like guest bios, Demetri's personal notes, transcripts and related podcasts with related content. It was important to Demetri that his audience could have exposure to his research so they could form their own ideas about any given topics. He wanted to share the information but, more importantly, encourage his audience to think for themselves. An integrated CMS system lets the Hidden Forces team add and edit content and the responsive layout accommodates desktop and mobile use. The site launched featuring podcasts and there are plans to add videos, articles, events and other featured content so we've planned for this be establishing labeling standards ahead of time and creating accommodating layout. We began the design process with a two-day workshop led by Aly Hasham (product), Diego Fiorentin (technology) and myself (design). In this workshop we identified design values that could be taken into a series of design sprints. Because we could easily identify competitor sites and discuss what we liked, and didn't like, about them - and there's already a clear body of precedents for podcast websites - I bypassed wire-framing as an initial design stage. Instead, I focused the early stages of design on generating emotional reactions by producing a series of high-fidelity mockups that expressed a broad range of aesthetics and audience appeal. This strategy allowed up to get Demetri and his partner excited and emotional about our process, and from these discussions, were able to tease out some interesting ideas that might not have surfaced if we had simply started with wireframes. Namely, the idea that the site would function as an in-browser podcast player. While this idea isn't 100% unique we were able to elevate that goal to a primary design value and optimize the design and underlying technology to reinforce that usage pattern. Special thanks to the folks at Plump (Aly Hasham, Brian Wane, and Diego Fiorentin), David Porzio and Demetri Kofinas from Hidden Forces, and Nathaniel Pollard for the awesome photo treatments.